Ozone Group has come up with a fantastic real-estate project in the northern sector of Bangalore. Ozone Urbana Prime will offer spacious 1, 2 and 3 BHK apartments to choose from. Spread over 185 acres of a splendid landscape this project will house an unending list of amenities and social infrastructures. A total of 128 units of 1BHK apartments, 197 2BHK apartments and 355 3BHK units will be on offer. 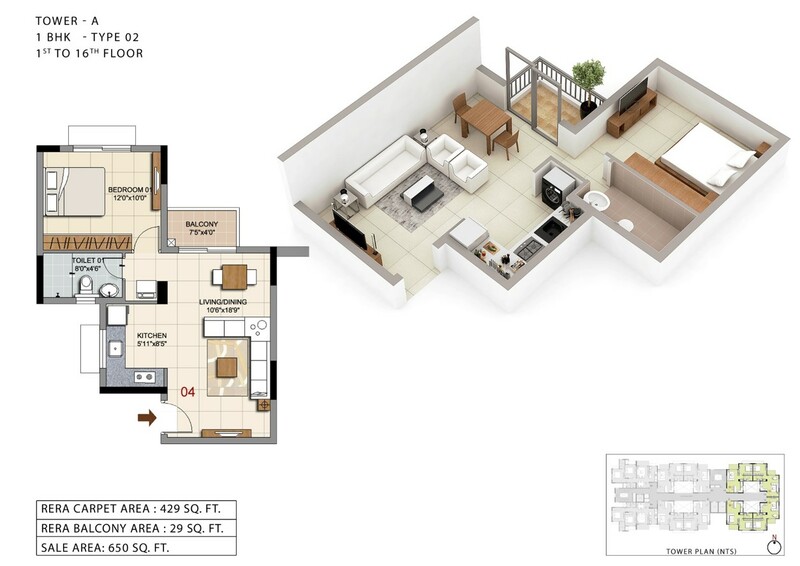 The 3BHK units will house both compact and large units – 231 compact units and 142 – large units. The 3 towers which are currently ready for launch will span over 10.5 Acres which is a cluster in 185 acres. 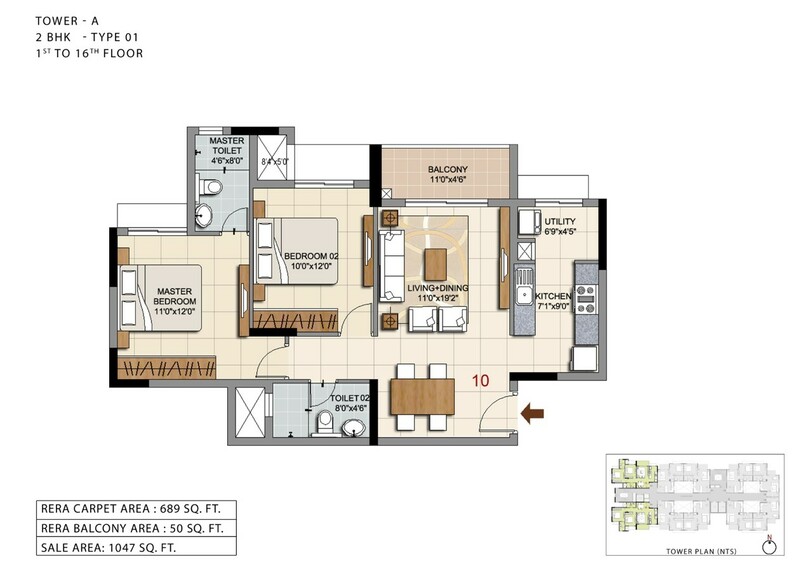 The 2BHK units here will span between 1035 – 1296 Sqft. while the 1BHK units will be 650 Sqft. 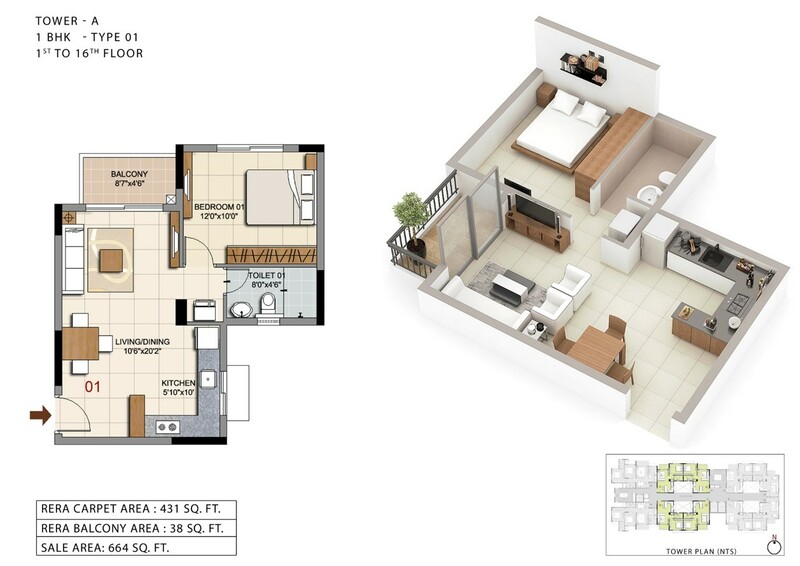 The 3BHK compact units will be roughly 1360-1468 Sqft. 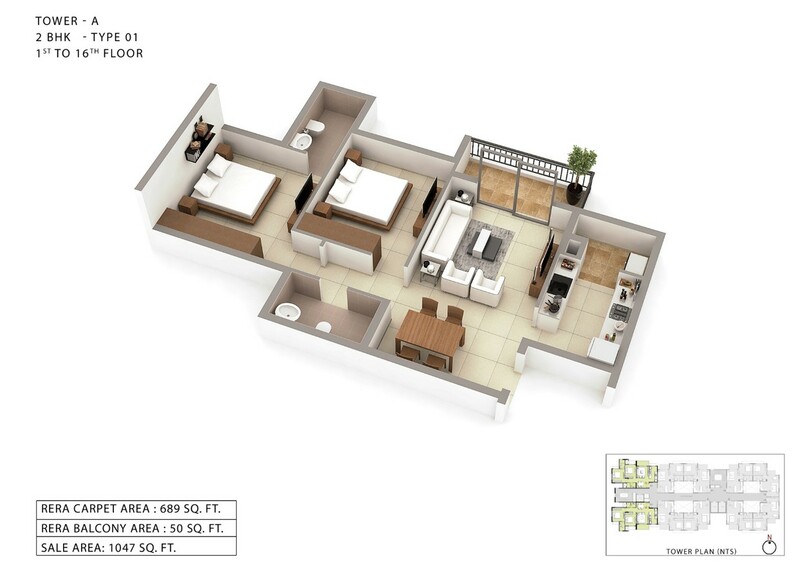 and the large units will be 1536 – 1543 Sqft. Each of the floors here will house 8 units and 4 elevators in total. The magnificent landscape here will mesmerize a resident. 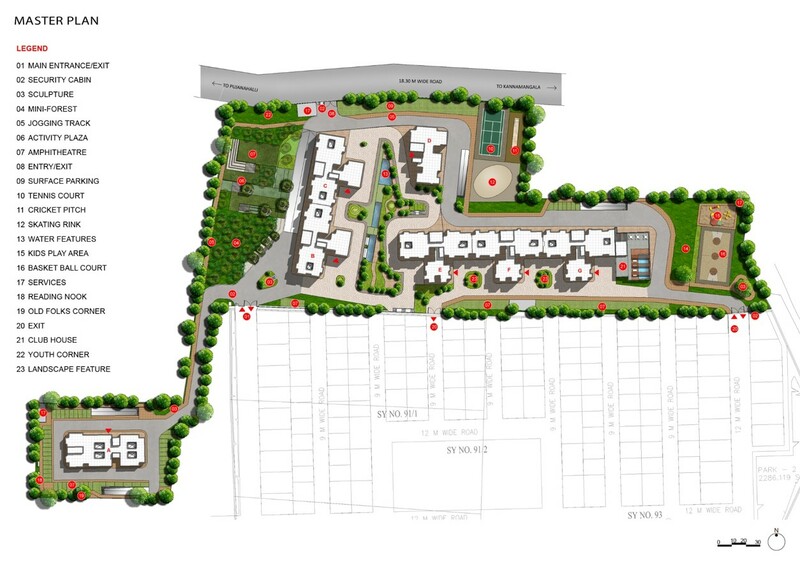 70% open space in the project will residents an unforgettable experience to live. The possession of the units at this splendid project is set to begin from 2022. The tower here will be G+16 floors here. • 250 bed New Medical Centre hospital, inside the project premises. • 2 lakh sq. ft. of temptation. The hyper mall, inside the project. • 174 business travelers will find room for business at the 4 Star Business Hotels - Hyatt Palace, inside the campus. Throw exciting parties at the 300 people Banquet facility, at the Hyatt Palace, inside the campus. • 8000 trees, inside the campus equal to the number of Trees in Lalbagh reducing 40 tonnes of CO2, every day. • 3.5 million litres of total on-site treated wastewater that will be reused. Every week we will be recycling water equivalent to Lalbagh lake. • Fibre-to- the-home (FTTH) for telephone, Internet, Video, security and telemedicine will be provided for every residence. • Around 45,000 people, that is the equivalent of the capacity of Chinnaswamy stadium, will be living and be working in Ozone Urbana, every day! All in the campus. • Approximately 2 lakh sq ft of Clubhouses located within the campus, to keep fit over 25,000 people! • 3kms of biking trails and 10 km of designer walk-ways to keep you fit, within the campus. • More than 20 multi-cuisine restaurants to cater to your every taste, within the campus. • 15 different types of play courts scattered all around the campus. What should you know about Ozone Prime ? The expression or interest in Ozone Urbana Prime is fixed at 1Lakh. While 1BHK units are priced at a maximum 35 Lacs and 2BHK units will carry a maximum price tag of 50 Lacs. Floor premium charges and registration charges are excluded. The payment plans are flexible so as to meet the needs of the residents. The base selling price is set at 3599* / Sqft. Life at Ozone Urbana Prime will be one-of-a-kind and immensely comfortable. Making each and every resident happy today, tomorrow and everyday. Devanahalli , is located on the NH-7 also known as the Bangalore-Hyderabad Highway. A railway station also runs along the National Highway 7, providing easy railway connectivity in the area. Several government approved residential projects and townships are also located close to the highway. Property for sale in Devanahalli is in demand due to its proximity to areas such as K R Puram, Nehru Nagar, Hebbal and Outer Ring Road. There are a number of reputed schools and educational institutions in the locality. Additionally, there is also a presence of several reputed health care facilities in and around the locality. The floor plan of Ozone Urbana Prime will be perfect for small ad nuclear families. They are also a perfect option for investment purposes. Ozone Urbana will offer both 1 and 2 BHK apartments to choose from. The 1 BHK units here will be 650 Sqft, While the 2BHK units here will be 1035-1296 Sqft and the 3 BHK units are of two types that is, Compact: 1360-1468 sqft and the Large : 1536-1543 sqft. .
Get in touch now to know more. The expression or interest in Ozone Urbana Prime is fixed at 1Lakh. While 1BHK units are priced at a maximum 35 Lacs and 2BHK units will carry a maximum price tag of 50 Lacs. Floor premium charges and registration charges are excluded. The payment plans are flexible so as to meet the needs of the residents. How to Book apartment in Urbana Prime by Ozone ? New launch from Godrej properties at Sarjapur Road. Disclaimer: By accessing this website, the viewer confirms that the information including brochures and marketing collaterals on this website are solely for informational purposes only and the viewer has not relied on this information for making any booking/purchase in any project of the Company. Nothing on this website, constitutes advertising, marketing, booking, selling or an offer for sale, or invitation to purchase a unit in any project by the Company. The Company is not liable for any consequence of any action taken by the viewer relying on such material/ information on this website. This website belongs to official partner.